I have to make some room in my garage. 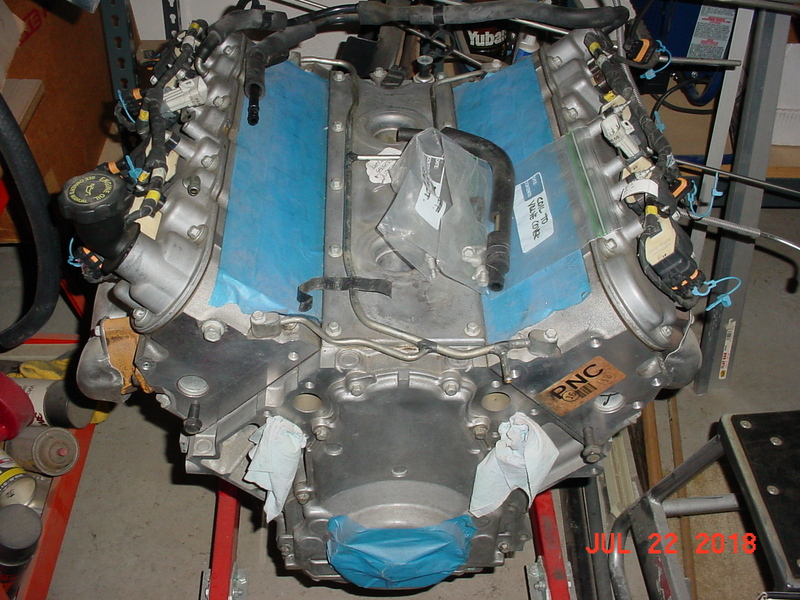 I made an earlier post about possible pricing on an LS1 long block engine. As much as it kills some of my dreams on my projects I need to sell this. This is the LS1 I pulled from my '98 Firebird for an LS6. This engine has the exhaust manifolds and oil pan installed from a Cadillac CTS/V. The engine has NOT been oil primed. Any time the oil pan is removed from an LS engine it has to be primed through the galley port on the driver's side of the block. It's still a good usable engine and I'd swap it into something that needed a Gen III engine if I had one. I have a Corvette/ Cadillac balancer and water pump or F-body balancer and water pump depending on usage. My T56 was a good shifting trans that had a worn pilot bearing surface on the input shaft. I posted it for sale on Ebay and I think the high bidder is a scammer and I'm not going to get paid so it may be available this weekend by 6-30. The bid climbed to $1525 so that's where I'll start my offer. On the LS1 I'm thinking $2400 OBO. Third gen board seems to be the most active so I'm posting here. It looks like I have a bona fide bidder on my T56 so it will probably sell. Hopefully the scammers stay away and it goes to a real buyer. I'll post pics of my LS1. I would love to keep it but I have to make room in the garage at this time. T56 is sold. I have this LS1 long block I want to sell. I have LS1 or LS6 balancers and water pumps available depending on the pulley system used.